High performance Modular Screen Panels for high wear screening applications. Corrosion Engineering modular rubber screen panels are extremely effective in screening applications where abrasion and impact conditions are severe. Modular screen panels are available in a variety of innovative rubber compounds designed to eliminate plugging and blinding and to maximize wear life performance. Modular screen panels are easy to install, and when compounded from Corrosion Engineering’s proprietary rubber compounds will deliver up to 15 times more life versus conventional steel, and urethane screens. Modular screen panels from Corrosion Engineering are excellent for your high wear mining and screening applications, scalping, and screening applications which require fast and easy panel change out. Corrosion Engineering screen panels are manufactured with engineered rubber compounds that provide the longest wear life and highest performance available in the industry. When availability and process performance are important, the best modular screen panel choice is Corrosion Engineering. Corrosion Engineering modular screen panels are designed to resist high impact and heavy loads while maintaining exceptional screening efficiency provided by Corrosion’s advanced abrasion resistant rubber compounds, molded tapered openings to prevent plugging, and Corrosion Engineering’s unique Hi-Pro slot design that improves material throughput as compared to conventional slot apertures. 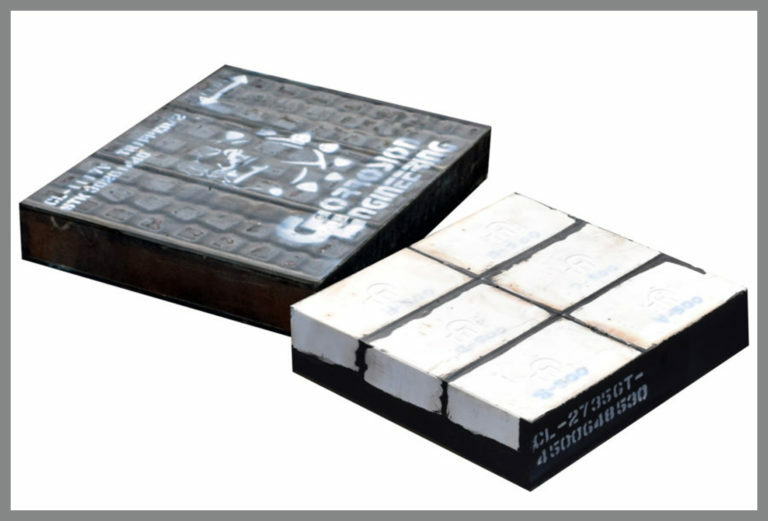 In extreme wear environments, advanced CorroCeramics with exceptional hardness and ultimate wear resistance can be incorporated for maximized performance. The panels are available in many sizes and will fit most common installation systems. Molded tapered openings prevent plugging common in punched panels. Corrosion Engineering offers modular screens with square openings ranging from ½” through 4”, and rectangular openings from 1/4” x 1” to 3” x 6”. Our Modular screen panels are specifically engineered and custom designed for your unique application. The rubber compounds utilized to manufacture your Modular screen panel in addition to the internal construction of the panel will be based on your specific requirements.